ANAXAGORAS of Klazomenae, son of Hegesiboulos, was born in the seventh Olympiad (500-497) and died in the first year of the eighty-eighth Olympiad (428), according to the chronicles of Apollodoros. It is said that he neglected his possessions in his pursuit of philosophy; he began to teach philosophy in the archonship of Kallias at Athens (480). The fall of a metoeoric stone at Aegos Potamoi (467 or 469) influenced profoundly his views of the heavenly bodies. Perikles brought him to Athens, and tradition says he remained there thirty years. His exile (434-432) was brought about by enemies of Perikles, and he died at Lampsakos. He wrote but one book, according to Diogenes, and the same authority says this was written in a pleasing and lofty style. Literature:—Shaubach, Anax. Claz. Frag. Lips. 1827; W. Schorn, Anax. Claz. et Diog. Apoll. Frag. Bonn 1829; Panzerbieter, De frag. Anax. ord. Meining. 1836; Fr. Breier, Die Philosophie des Anax. nach Arist. Berl. 1840. Cf. Diels, Hermes xiii. 4. 1. All things were together, infinite both in number and in smallness; for the small also was infinite. And when they were all together, nothing was clear and distinct because of their smallness; for air and aether comprehended all things, both being infinite; for these are present in everything, and are greatest both as to number and as to greatness. 2. For air and aether are separated from the surrounding mass; and the surrounding (mass) is infinite in quantity. 4. But before these were separated, when all things were together, not even was any colour clear and distinct; for the mixture of all things prevented it, the mixture of moist and dry, of the warm and the cold, and of the bright and the dark (since much earth was present), and of germs infinite in number, in no way like each other; for none of the other things at all resembles the one the other. 3. And since these things are so, it is necessary to think that in all the objects that are compound there existed many things of all sorts, and germs of all objects, having all sorts of forms and colours and tastes. 10. And men were constituted, and the other animals, as many as have life. And the men have inhabited cities and works constructed as among us, and they have sun and moon and other things as among us; and the earth brings forth for them many things of all sorts, of which they carry the most serviceable into the house and use them. These things then I have said concerning the separation, that not only among us would the separation take place, but elsewhere too. 11. So these things rotate and are separated by force and swiftness. And the swiftness produces force; and their swiftness is in no way like the swiftness of the things now existing among men, but it is certainly many times as swift. 14. When they are thus distinguished, it is necessary to recognise that they all become no fewer and no more. For it is impossible that more than all should exist, but all are always equal. 5. In all things there is a portion of everything except mind; and there are things in which there is mind also. 7. And when mind began to set things in motion, there was separation from everything that was in motion, and however much mind set in motion, all this was made distinct. The rotation of the things that were moved and made distinct caused them to be yet more distinct. 8. The dense, the moist, the cold, the dark, collected there where now is the earth; the rare, the warm, the dry, the bright, departed toward the farther part of the aether. 12. But mind, as it always has been, especially now also is where all other things are, in the surrounding mass, and in the things that were separated, and in the things that are being separated. 13. Things in the one universe are not divided from each other, nor yet are they cut off with an axe, neither hot from cold, nor cold from hot. 15. For neither is there a least of what is small, but there is always a less. For being is not non-being. 1. I.e. things are called after the element or elements (homoeomeries) which predominate in their make-up. 2. Cf. Herakleitos, Fr. 68. But there is always a greater than what is great. And it is equal to the small in number; but with reference to itself each thing is both small and great. 16. And since the portions of the great and the small are equal in number, thus also all things would be in everything. Nor yet is it possible for them to exist apart, but all things include a portion of everything. Since it is not possible for the least to exist, nothing could be separated, nor yet could it come into being of itself, but as they were in the beginning so they are now, all things together. And there are many things in all things, and of those that are separated there are things equal in number in the greater and the lesser. (18.) For how could hair come from what is not hair? Or flesh from what is not flesh? PASSAGES FROM PLATO REFERRING TO ANAXAGORAS. Apol. 26 D. He asserts that I say the sun is a stone and the moon is earth. Do you think of accusing Anaxagoras, Meletos, and have you so low an opinion of these men and think them so unskilled in letters as not to know that the books of Anaxagoras of Klazomenae are full of these doctrines? And forsooth the young men are learning these matters from me, which sometimes they can buy from the orchestra for a drachma at the most, and laugh at Sokrates if he pretends that they are his—particularly seeing they are so strange. 97 C. I heard a man reading from a book of one Anaxagoras (he said), to the effect that it is mind which arranges all things and is the cause of all things. 98 B. Reading the book, I see that the man does not make any use of mind, nor does he assign any causes for the arrangement of things, but he treats air and aether and water as causes, and many other strange things. Lysis 214 B. The writings of the wisest men say . . . that it is necessary for the like always to be loved by the unlike. Hipp. Mai. 283 A. They say you had an experience opposite to that of Anaxagoras; for though he inherited much property he lost it all by his carelessness; so he practised a senseless wisdom. Kratyl. 400 A. And do you not believe Anaxagoras that the nature of all other things is mind, and that it is soul which arranges and controls them? (cf. 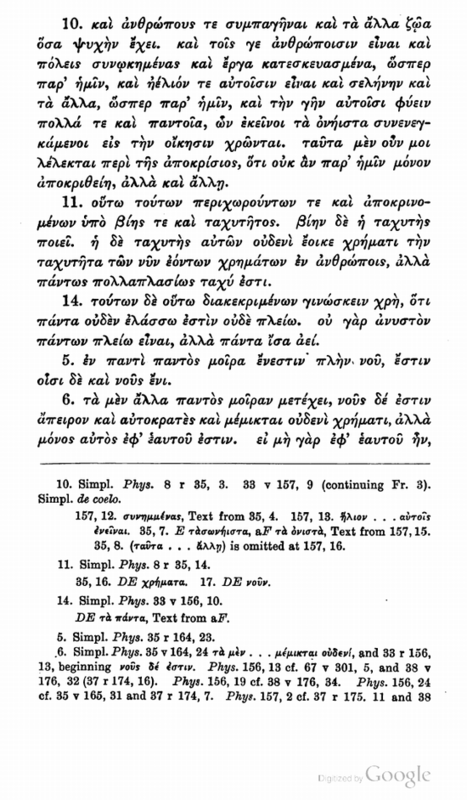 Phaedo 72 C). 409 A. It looks as though the opinion Anaxagoras recently expressed was a more ancient matter, that the moon has its light from the sun. 413 C. Anaxagoras is right in saying that this is mind, for he says that mind exercising absolute power and mingled with nothing disposes all things, running through all. Riva1. 132 A. But the youths seemed to be quarrelling about Anaxagoras or Oenopedos, for they were evidently drawing circles and imitating certain inclinations by the slope of their hands with great earnestness. Phil. 28 C. All the wise men agree that mind is king of heaven and earth for us. 30 D. Some long ago declared that always mind rules the all. Legg. 967 B. And some had the daring to conjecture this very thing, saying that it is mind which disposes all things in the heavens. And the same men again, being in error as to the nature of soul, in that it is older than bodies, while they regarded it as younger, to put it in a word, turned all things upside down, and themselves most of all. For indeed all things before their eyes—the things moving in the heavens—appeared to them to be full of stones and earth and many other soulless bodies, which dispose the causes of all the universe. Phaedr. 270 A. All the arts that are great require subtlety and the higher kind of philosophy of nature; so such loftiness and complete effectiveness seem to come from this source. 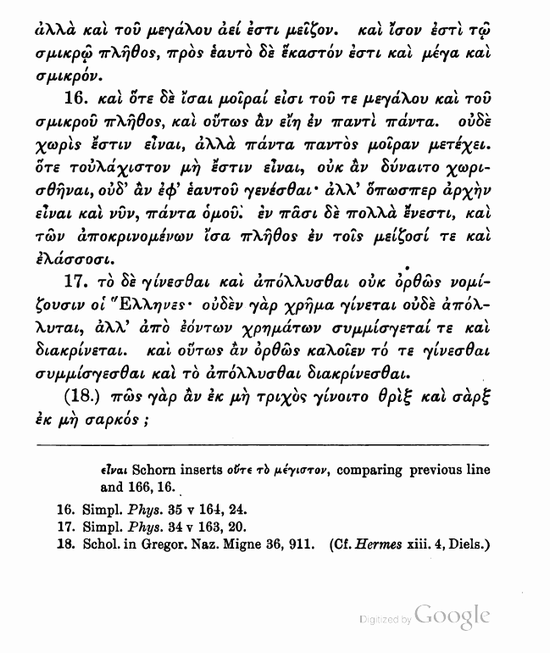 This Perikles acquired in addition to being a man of genius; for as the result, I think, of his acquaintance with such a man as Anaxagoras he became imbued with high philosophy, and arrived at the nature of intelligence [νους] and its opposite, concerning which Anaxagoras often discoursed, so that he brought to the art of speaking what was advantageous to him. PASSAGES IN ARISTOTLE REFERRING TO ANAXAGORAS. things were together, and he established the fact that such 'arising' was change of form. Phys. i. 4; 187 a 36. They thought that (what arose) arose necessarily out of things that are and their attributes, and, because the masses were so small, out of what we cannot perceive. Wherefore they say that everything was mixed in everything because they saw everything arising out of everything; and different things appeared and were called different from each other according to what is present in greater number in the mixture of the infinites; for the whole is not purely white or black or sweet or flesh or bone, but the nature of the thing seems to be that of which it has the most. Phys. iii. 4; 203 a 19. And as many as make the elements infinite, as Anaxagoras and Demokritos, the former out of homoeomeries. . . .
Phys. iii. 5; 205 b 1. Anaxagoras speaks strangely about the permanence of the infinite; for he says that the infinite itself establishes itself—that is, it is in itself; for nothing else surrounds it, so that wherever anything may be, it is there in virtue of its origin. Phys. iv. 6; 213 a 22. Some who try to show that the void does not exist, do not prove this of what men are wont to call a void, but they make the mistake Anaxagoras did and those who attempted to prove it after this manner. For they show that air is something, blowing skins up tight, and showing how strong air is, and shutting it up in clepsydrae. 1. Cf. 265 b 22. De caelo i. 3; 270 b 24. Anaxagoras does not use this word (αὶθηρ) rightly, for he uses the word aether instead of fire. De caelo iii. 2; 301 a 12. Anaxagoras starts to construct the universe out of non-moving bodies. De caelo iii. 3; 302 a 31. 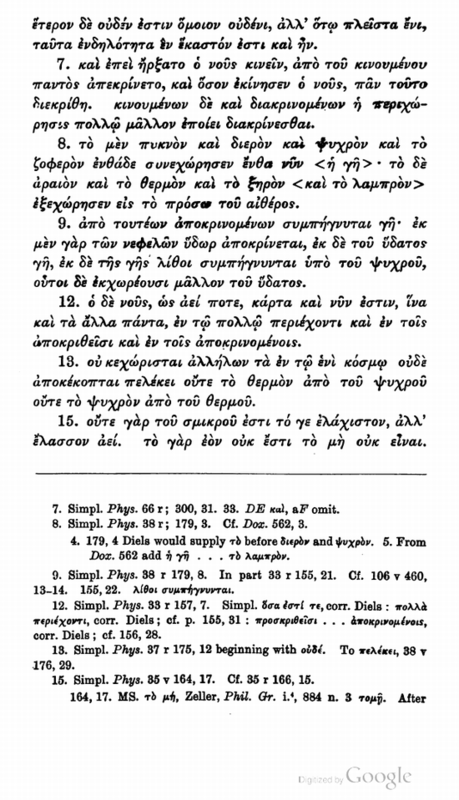 Anaxagoras says the opposite to Empedokles, for he calls the homoeomeries elements (I mean such as flesh and bone and each of those things), and air and fire he calls mixtures of these and of all the other 'seeds;' for each of these things is made of the invisible homoeomeries all heaped together. Wherefore all things arise out of these things; for he calls fire and aether the same. And since there is a peculiar motion of every material body, and some motions are simple and some complex, and the complex motions are those of complex bodies and the simple motions of simple bodies, it is evident that there will be simple bodies. For there are also simple motions. So it is evident what elements are, and why they are. De caelo iv. 2; 309 a 20. Some of those who deny that there is a void say nothing definite concerning lightness and weight, for instance Anaxagoras and Empedokles. 1. Cf. Met. 989 b 15.
are an infinite number of elements. 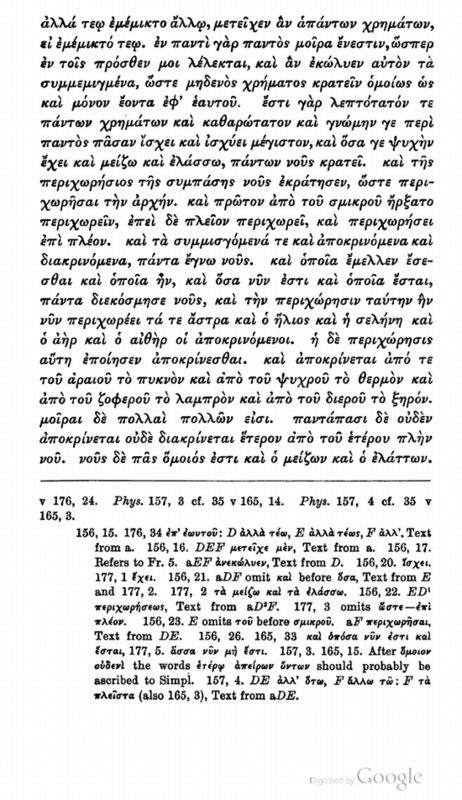 For he regards the homoeomeries as elements, such as bone and flesh and marrow, and other things of which the part (μερος) has the same name as the whole. De anima i. 2; 404 a 25. In like manner Anaxagoras says that soul is the moving power, and if any one else has said that mind moved the all, no one said it absolutely as did Demokritos. De anima i. 2; 404 b 1. Anaxagoras speaks less clearly about these things; for many times he rightly and truly says that mind is the cause, while at other times he says it is soul; for (he says) it is in all animals, both great and small, both honoured and dishonoured. But it is not apparent that what is intelligently called mind is present in all animals alike, nor even in all men. De anima i. 19; 405 b 19. Anaxagoras alone says that mind does not suffer change, and has nothing in common with any of the other things. De anima iii. 4; 429 a 18. It is necessary then that it be unmixed since it knows [νοει] all things, as Anaxagoras says, in order that it may rule, that is, that it may know [γνωρίζη]. De part. anim. iv. 10; 687 a 7. Anaxagoras says that man is the most intelligent of animals because he has hands. 1. Cf. iii. 4; 429 b 24. De plant. i.; 815 a 16. Anaxagoras said that plants are animals and feel pleasure and pain, inferring this because they shed their leaves and let them grow again. De plant. i.; 816 b 26. Anaxagoras said that plants have these (motion and sensation) and breathing. De plant. i.; 817 a 26. Anaxagoras said that their moisture is from the earth, and on this account he said to Lechineos that the earth is mother of plants, and the sun father. De X. Z. G. ii. ; 976 b 20. Anaxagoras busying himself on this point, was satisfied with saying that the void does not exist, nevertheless he says beings move, though there is no void. Meta. i. 3; 984 a 11. Anaxagoras of Klazomenae, who preceded him (Empedokles) in point of age and followed him in his works, says that the first principles are infinite in number; for nearly all things being made up of like parts (homoeomeries), as for instance fire and water, he says arise and perish only by composition and separation, and there is no other arising and perishing, but they abide eternal. Meta. i. 3; 984 b 8. Besides these and similar causes, inasmuch as they are not such as to generate the nature of things, they (again compelled, as we said, by the truth itself) sought the first principle which lay nearest. For perhaps neither fire nor earth nor any other such thing should fittingly be or be thought a cause why some things exist and others arise; nor is it well to assign any such matter to its voluntary motion or to chance. Moreover one who said that as mind exists in animals, so it exists in nature as the cause of the universe and of all order, appeared as a sober man in contrast with those before who spoke rashly. at a loss for the cause why anything necessarily is, then he drags this in, but in other cases he assigns any other cause rather than mind for what comes into being. does not speak rightly or clearly, still he means something like those who spoke later and with greater clearness. Meta. iii. 5; 1009 b 25. And he called to mind the saying of Anaxagoras that just such things as men assume will be real for them. Meta. x. 6; 1063 b 25. According to the position of Herakleitos, or of Anaxagoras, it is not possible to speak the truth. Ethic. vi. 5; 1141 b 3. Wherefore they say that Thales and Anaxagoras and such wise men are lacking in intelligence, when they see them ignorant in things that are for their own advantage, and they say they know things extraordinary and wonderful and dreadful and divine, but these are of no use, because they do not seek human good. Ethic. x. 9; 1179 a 13. And Anaxagoras did not seem to regard the rich man nor yet the powerful man as the happy one when he said he would not be surprised if any one appeared strange to the many; for these judge by what is outside, for that is all they can see. 1. Cf. iv. 4; 1007 b 25.
understand how anything should arise out of not-being, or perish into not-being. Certainly we take simple food of one kind, such as the bread of Demeter, and we drink water; and from this nourishment there are nurtured hair, veins, arteries, sinews, bones, and the other parts. Since these arise we must acknowledge that in the nourishment that is taken are present all realities, and from them everything will grow. And in that nourishment there are parts productive of blood and of sinews and bones and the rest; these are the parts that may be discovered by contemplation. For it is not necessary to perceive everything by sense, how that bread and water give rise to these things, but the parts may be discovered in them by contemplation. From the fact that parts exist in the nourishment like the things that are generated, he called them homoeomeries, and declared that they are the first principles of things; and he called the homoeomeries matter, but the active cause that arranges all things is mind. And he began thus: All things were together and mind arranged and disposed them. So we must assert that he associated an artificer with matter. i. 7; 299. Anaxagoras says that bodies are established according to first principles, and the mind of God arranged them and caused the generations of all things. i. 7; 302. The mind that made the universe is God. i. 14; 312. Anaxagoras: The homoeomeries are of many shapes. i. 17; 315. Anaxagoras and Demokritos: The elements are mixed by juxtaposition. i. 24; 320. (See p. 241. i. 29; 326.) Anaxagoras and the Stoics: Cause is not evident to human reason; for some things happen by necessity, and others by fate, and others by purpose, and others by chance, and others of their own accord. i. 30; 326. Anaxagoras: Origination is at the same time composition and separation, that is, genesis and destruction. Aet. Plac. ii. 1; 327. The universe is one. 11. 4; 331. The universe is perishable. ii. 8; 337. Diogenes and Anaxagoras: After the universe arose and the animals were brought forth out of the earth, it tipped somehow of its own accord towards its south part, perhaps intentionally, in order that some parts of the universe might be inhabited and others uninhabited according as they are cold, or hot, or temperate. ii. 13; 341. Anaxagoras: The surrounding aether is of a fiery nature, and catching up stones from the earth by the power of its rotation and setting them on fire it has made them into stars. ii. 16; 345. Anaxagoras et al. : All the stars move from east to west. ii. 21; 351. Anaxagoras: The sun is many times as large as the Peloponnesos. ii. 23; 352. Anaxagoras: The solstices are due to a repulsion of the air towards the south, for the sun compressed it and by condensation made it strong. ii. 25; 356. Anaxagoras and Demokritos: The moon is a fiery solid body having in itself plains and mountains and valleys. i. 29; 360. Anaxagoras, as Theophrastos says, attributed eclipses to bodies below the moon which sometimes come in front of it.1 ii. 30; 361. Anaxagoras says that the unevenness of the composition (the surface of the moon) is due to the mixture of earthy matter with cold, since the moon has some high places and some low hollows. And the dark stuff is mingled with the fiery, the result of which is the shadowy appearance; whence it is called a false-shining star. Aet. Plac iii. 1; 365. Anaxagoras: The shadow of the earth falls along this part of the heaven (the milky way), when the sun is beneath the earth and does not shed light on all things. iii. 2; 366. Anaxagoras and Demokritos: (Comets etc.) are due to the conjunction of two or more stars, and the combination of their rays. 367. 1. Cf. Theophr. Phys. op. Frag. 19; Dox. 493. The so-called shooting stars come darting down from the aether like sparks, and so they are immediately extinguished. iii. 3; 368. Anaxagoras: When the hot falls on the cold (that is, aether on air), it produces thunder by the noise it makes, and lightning by the colour on the black of the cloud, and the thunderbolt by the mass and amount of the light, and the typhoon by the more material fire, and the fiery whirlwind by the fire mixed with cloud. iii. 4; 371. Anaxagoras: Clouds and snow are formed in somewhat the same manner; and hail is formed when, already cooled by its descent earthwards, it is thrust forth from frozen clouds; and it is made round. iii. 5; 373. Anaxagoras: (The rainbow) is a reflection of the sun's brightness from thick cloud, and it is always set opposite the star which gives rise to the reflection. And in a similar way he accounts for the so-called parhelia, which take place along the Pontos. iii. 15; 379. Anaxagoras: (Earthquakes take place) when the air falls on the thickness of the earth's surface in a sheltered place, and it shakes the surrounding medium and makes it tremble, because it is unable to effect a separation. iii. 16; 381. Anaxagoras: When the moisture which was at first gathered in pools was burned all around by the revolution of the sun, and the fresh water was evaporated into saltness and bitterness, the rest (of the sea) remained. on solid air, and by the return of the blow which is dealt to the ear; so that what is called an echo takes place. Aet. Plac. v. 7; 420. Anaxagoras, Parmenides: Males are conceived when seed from the right side enters the right side of the womb, or seed from the left side the left side of the womb; but if its course is changed females are born. v. 19; 430. As Anaxagoras and Euripides say: Nothing of what is born dies, but one thing separated from one part and added to another produces different forms. v. 20; 432. Anaxagoras: All animals have reason that shows itself in activity, but they do not have a sort of intelligence that receives impressions, which may be called the interpreter of intelligence. v. 25; 437. Anaxagoras: Sleep is due to a weariness of the body's energy; for it is an experience of the body, not of the soul; and death is the separation of the soul from the body. speaks of two first principles, the nature of the infinite and intelligence, so that he appears to treat all the material elements in much the same manner as Anaximandros. Phys. op. Fr. 19; Dox. 493. See Aet. ii. 29; Dox. 360, translated above, p. 255. Phys. opin. Fr. 23; Dox. 495. And the third opinion about the sea is that the water which filters and strains through the earth becomes salt because the earth has such flavours in it; and they point out as a proof of this that salt and saltpetre are dug up out of the earth, and there are bitter flavours at many places in the earth. Anaxagoras and Metrodoros came to be of this opinion. the brain; for the surrounding bone against which the sound strikes is hollow. And every sensation is attended with pain, which would seem to follow from the fundamental thesis; for every unlike thing by touching produces distress. And this is evident both in the duration and in the excessive intensity of the sensations. For both bright colours and very loud sounds occasion pain, and men are not able to bear them for any long time. And the larger animals have the more acute sensations, for sensation is simply a matter of size. For animals that have large, pure, and bright eyes see large things afar off, but of those that have small eyes the opposite is true. And the same holds true of hearing. For large ears hear large sounds afar off, smaller ones escape their notice, and small ears hear small sounds near at hand. And the same is true of smell; for the thin air has the stronger odour, since warm and rarefied air has an odour. And when a large animal breathes, it draws in the thick with the rarefied, but the small animal only the rarefied, so that large animals have a better sense of smell. For an odour near at hand is stronger than one far off, because that is thicker, and what is scattered is weakened. It comes about to this, large animals do not perceive the thin air, and small animals do not perceive the thick air. is determined. But what could be inside of mind? So the living being would be joined with an external body. But since this is not satisfactory, and mind is 'open and simple,' joined with nothing by means of which it can feel, he seems to go beyond the scope of our intelligence. 1. I translate the suggestion of Diels in his notes. 2. Cf. Aet. iv. 1, supra, p. 256.
are borne about by the revolution of the aether. And sun and moon and certain other bodies moving with them, but invisible to us, are below the stars. Men do not feel the warmth of the stars, because they are so far away from the earth; and they are not warm in the way that the sun is, because they are in a colder region. The moon is below the sun and nearer us. The sun is larger than the Peloponnesos. The moon does not have its own light, but light from the sun. The revolution of the stars takes them beneath the earth. The moon is eclipsed when the earth goes in front of it, and sometimes when the bodies beneath the moon go in front of it; and the sun is eclipsed when the new moon goes in front of it. And the solstices are occasioned because the sun and the moon are thrust aside by the air. And the moon changes its course frequently because it is not able to master the cold. He first determined the matter of the moon's phases. He said the moon is made of earth and has plains and valleys in it. The milky way is a reflection of the light of the stars which do not get their light from the sun. The stars which move across the heavens, darting down like sparks, are due to the motion of the sphere. 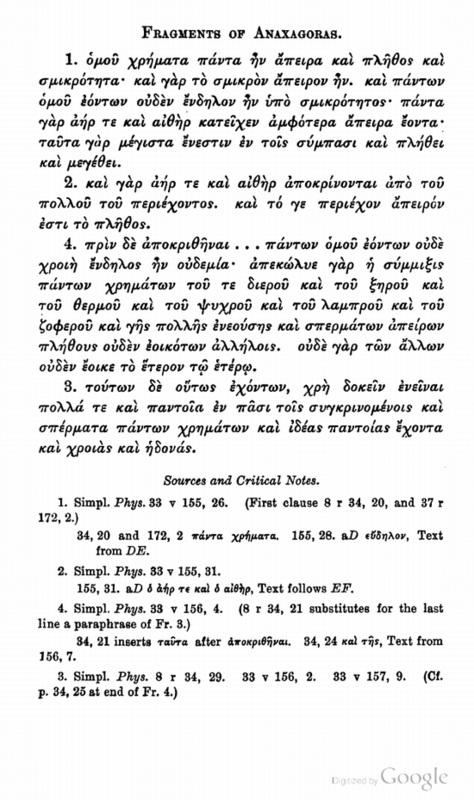 Olympiad, at the time when it is said Plato was born. They say that he became endowed with knowledge of the future. Herm. I. G. P. 6; Dox. 652. Anaxagoras takes me aside and instructs me as follows:—Mind is the first principle of all things, and it is the cause and master of all, and it provides arrangement for what is disarranged, and separation for what has been mixed, and an orderly universe for what was disorderly.